'La fine del mondo' a phrase Italians often use to describe New Zealand – means ‘the end of the world’ but it can also mean ‘can’t be beat’. Both meanings evoke the experience of migrants settling in Aotearoa, representing both the severance of life from the ‘homeland’ and their determination to make a new home in the world’s most distant settlement. These photographs by Edith Amituanai, who was brought up in Te Atatu by Samoan-born parents, are part of a series exploring the life of the Lai family from Myanmar (Burma) now living in Massey, and they continue her ongoing exploration of the concepts of home, community and identity. As a social record this work is invaluable. 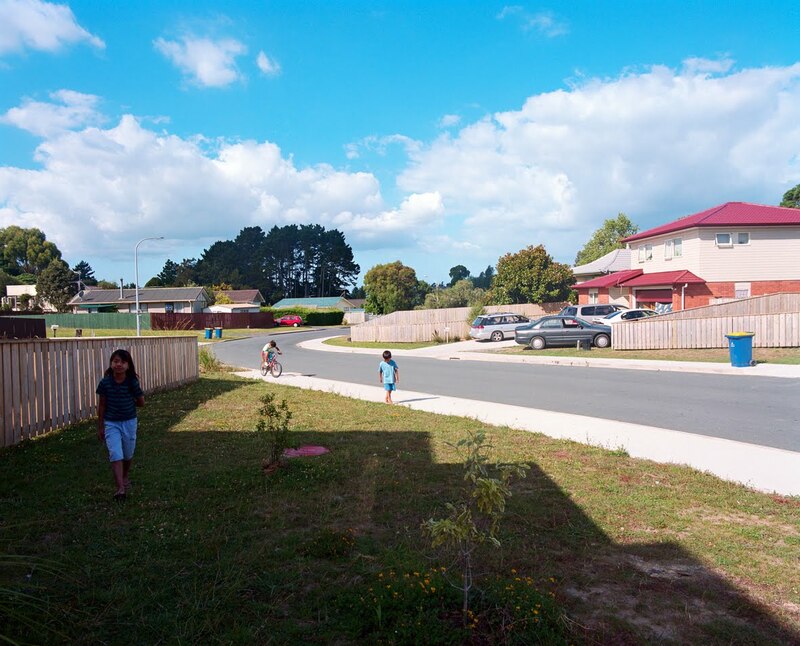 Edith documents the intimate details of domestic suburban life, focussing on subjects known to her, in a similar vein to Bob Raw’s study of his family in New Lynn in the 1960s. Both series are in contrast to the work of West Auckland historian J. T. Diamond whose photographs capture the Waitakere landscape before reforestation and the end of our local clay industry, photographs frequently bereft of people. Just as the Diamond archive is now foraged for incidental detail so too will these images. They have a confrontational rawness and a sense of heroism as this family asserts its right to be here and to forge the new story of their landscape so freshly planted as a subdivision. Edith captures the moment of the new street, the new house, the new life and transcends the mundane to evoke a universal story.